You might be surprised if the Vikings lay an egg here and don't make the playoffs, or worse, put up stinkers against the Seahawks and the Bears to close out the season. While unlikely, they could lose their next 4 and finish with a losing record, or even 3 of their next 4. No NFL head coach's job is safe anymore IMHO. Look at McCarthy in Green Bay. Did anyone think he wouldn't last the season? But he's gone with 4 games to play, and the Packers weren't even coming off a great prior season. The NFL is a "show me" league, and while I think Zimmer is probably going to make it to next season as the head coach, if the Vikes fall flat to end this season his tenure with the team could be in serious jeopardy, especially if they continue to get their hats handed to them for long stretches of games. Spielman, I don't know. The team has some talented players, and it's easier to argue that the head coach isn't wringing the most out of that talent rather than the GM isn't finding it and retaining it. Even on the offensive line, Spielman can argue the injury to Easton couldn't have been anticipated, nor the injury or drop off with Elflein. He can argue he found O'Neill in the 2nd and he's been a value pick. I'm not sure Spielman would be under the gun even if the season is a failure. But Zimmer sure could be. Absolutely. He needs his team to over-perform against a good team and he needs it soon. You're right, coaching fortunes can change in the NFL pretty quickly, especially when expectations are high. If this season were to end with a resounding "clunk" and three or four more losses (especially bad losses), Zimmer might be gone. I'd be as surprised by 4 more losses as I would be by 4 more wins but all season long, this has been a team that can can go in either direction. I'm guessing they'll finish with 8 or 9 wins but who knows? You're probably right about Spielman. I get the impression the Wilfs are pretty sold on him (although I don't know why). A really poor finish to this season might be enough to put him on notice but I doubt it would cost him his job. He had an 8-8 season two years ago too, where they started 5-0. You can't say it's just one season. And you can't say injuries, blah blah because every team has injuries. Sam Bradford had a great season that year. And of course, the OL was the weak link. If we can't hang on the bad seasons you can't hang on the good ones. He's had two good years in his 4.75. I'll give him a pass for year one. But not for year three and year five. This right here makes everything else you wrote meaningless. Sam Bradford was a lousy QB who had his best season playing for Zimmer. That is not a knock on Zim, it is high praise. You also apparently don't know what a great season by a QB looks like. The Oline was a weak link that year, and a close second was the timid play of the QB who threw for 3 yard completions on 3rd and 7+ at a record setting pace. There is not a coach in the NFL who has had worse luck at the QB spot than Zimmer, and people are complaining because he has only won the division twice in five years and has only made to the NFCCG once. This despite his GM doing a lousy job at signing and drafting Oline. I meant by Bradford standards. Not Tom Brady standards. I thought that was fairly obvious but apparently it wasn't. Everybody here knows I like Mike Zimmer, so I won't bore you all there. But I will say this in criticism of Zimmer ... a head coach calling the defense OR offense, to me, is a potential liability. This is true of Zimmer, for sure. Some guys supposedly make it work. But do they really? Sean McVay calls plays in LA, and they're dynamic. But they haven't won a championship. Andy Reid calls plays in KC ... same thing. Kyle Shanahan has back-to-back 10-loss seasons (which is probably an oversimplification, but still). Matt Nagy is doing a good job in Chicago, but I'd bet my house they don't win more than one playoff game. I'm too tired and lazy right now to do the research, but I'd venture a guess that very few head coaches who are primary playcallers on either side of the ball have won championships. To me, a head coach's time would be best spent overseeing everything. And with Zimmer, there really isn't that much reason for him to call the defense. George Edwards is an excellent defensive coach and knows exactly what Zimmer wants. He's been at Zimmer's side for five years. 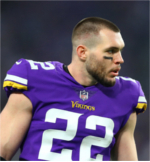 I'm no expert, but I have to wonder whether the Vikings wouldn't be better off with Edwards calling the defense and Zimmer keeping an eye on the entire store ... and maybe even offering a defensive perspective to help out John DeFilippo. I dont really know Edwards, if he is good or bad. I have a feeling Zimmer tells Edwards exactly what to run, and when, for the D.
I dont like this. Because right now we have problems everywhere, even with Zimmer, and he needs to take care of that first. And then figure out why he hasnt fired Pfifier yet. And why Flip is calling plays like Musgrave did. And maybe talk to Cousins more about opening up his game. He actually told the press COUSINS NEEDS TO RUN MORE. A QB making a billion dollars shouldnt have to be told thing like this. And why cant we find a decent #3 WR? This drives me crazy. Line up cook as a WR and Murray as the RB for crying out loud. Change things up so we can run the ball. Flip is too blah for my tastes. Cousins is making as many TOs as he would be if he opened the game up a bit, IMO. Audible into a run play once in a while.